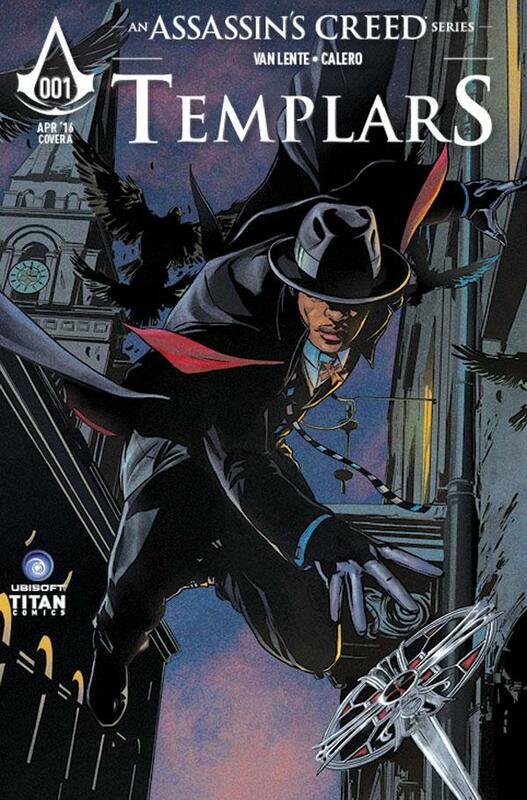 The Fellowship was fortunate enough to obtain a copy of TEMPLARS #1: BLACK CROSS from Titan Comics. Fred Van Lente writes, Dennis Calero draws and colors, and Richard Starkings and ComiCraft’s Jimmy Betancourt letter. It’s the Roaring Twenties, and the Knights Templar are not as powerful as they once were. The Gift family has been associated with them for a long time, but Thaddeus has managed to betray and pilfer much in the name of the Templars, and has still managed to lose it all. His young son Darius is left penniless, but the Order is giving him a chance to redeem the family honor. The Black Cross is a protector of the Order, and has been given reason to look within the Templars because of Thaddeus. But something is going on in China, and Darius is sent to make a delivery in the middle of it. And by the way, this is an Assassin’s Creed title, so the Black Cross has an agenda all his own. Lots of politics and violence will ensue, and the art is great at switching gears from London to Shanghai and from dark of night to brightness of day. This book is set in a volatile time, and the presence of the Templars can only make it more so. Darius is likeable, though, so we can pull for him to do well in this exciting story. TEMPLARS #1: BLACK CROSS is available now at your FLCS or at titan-comics.com.